I suppose I should begin this post by stating the obvious, my original plan to write one article a week on whatever wine book I am currently tackling in the series was a long shot at best. Although my intentions have been sincere, I won’t lead you back into my snake pit of false hope, preferring to offer a little injection of truth: I’ll do my best. So here we are, once again, cracking open the magical book of “The Wines of Spain” to continue on our journey into Spanish wine. 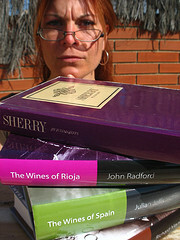 And as I recall, we were on Chapter 4, Rioja. Sadly my enthusiasm to begin this chapter is as bad as my desire to go outside in the sweltering heat for two reasons.The first reason is that I have committed to reading John Radford’s book, “Wines of the Rioja” for this assignment, hence reading this chapter seems a bit repetitive. Secondarily, and more importantly, Rioja has been so extensively talked about, especially here in Spain, that I find myself going into a deep catatonic state praying that the conversation will eventually go to any other DO but Rioja. And although Rioja genuinely does produce some fabulous wines, it’s equivalent to talking about a Paramount film as opposed to a small budget Independent film. Don’t Jim Jarmusch’s films “Coffee and Cigarettes” or “Night on Earth” sound so much more fascinating to chat about than “Batman Returns“? With 65 DOs in Spain, Rioja has had more than its fair share of the Spanish wine spotlight, while the little guys lack either the funding or the marketing strategy to be either seen or heard. Yet, there is always a silver lining to every story, and although I don’t intend to break this chapter apart like I’ve done with the others for reasons I’ve mentioned above, I do feel that Julian really took his time with this chapter on Rioja, offering a great in depth history full of cultural side notes that are for me, the most interesting part of any story. Therefore, after much internal debate, I’ve chosen my top three historical landmarks which have, in Julian’s eyes, molded and formed what Rioja is today. FUNGUS! I love this word, especially when this scary little creature is what has made Rioja the French winemaker’s bestfriend. In 1852, the deadly fungus Oidium, also known as Uncinula necator, traveled from the USA through France to Portugal (I assume by boat), and eventually to Rioja where yields where some vineyards were completely wiped out. The fungus was later destroyed by placing sulfur on the vines. But then came Phylloxera, which also originated in the USA along with Crispy Creams and bad Reality TV shows, and proceeded to annihilate many French vineyards. However, the French lived a funky little reality believing that the Pyrenees was like Kryptonite to Phylloxera sending them in droves to other side into Spain where they set up shop and began to mature their wines. This was a landmark event for Spain, because peasant growers previously dumped the previous vintage before harvesting the new one. As a result of having neither the investments nor the capital to purchase casks for maturation, peasants were ignorant of such technology. By the time Phylloxera did hit Rioja in 1899, our dear French neighbors to the North had already established word-class vineyards. ROADS! Back in the 1800’s, Rioja didn’t have a convenient mode of transportation to connect it with its commercial neighbor, Bilbao. Between the Napoleanic invasion, the Carlist Wars, Cholera and poverty, roads fell to the bottom of the priority list. This changed in 1880 when a railway was built between Haro and Bilbao, bringing dozens of bodegas with it! WWI! During the first World War, all French wine ceased to be exported to the USA, leaving the market wide open for the Spanish. This event resulted in the creation of 35,000 hectares of vines by 1935, only to be destroyed once again by both the Spanish Civil War and WWII. The only importer during this time was to Switzerland. This is only a small portion of several significant events that placed Rioja on the International wine market as outlined by Julian. For those interested, I would highly suggest reading this not only because he does a good job – significantly better than the other chapters – in providing a good historical backdrop to the creation of Rioja, but also because he goes through at least a dozen different Bodegas providing an equally detailed history for each one. All of this coupled with both his lengthy description of winemaking and aging specifically to Rioja makes this a great reference book. If anyone has read this Chapter, I’d be interested to get your take on what you both enjoyed and what you found to your dislike. I’d also be curious to know if anyone else is in the same camp regarding Rioja and its monopoly on forming the image of what is “spanish wine”? Finally, allow me to end this post re-emphasizing my intention to dig deep into the history, culture and viniculture of Rioja when I tackle John Radford’s book, but for now, let’s move on to Chapter 5: Navarra and one of my favorite wines, Txacoli!